Mopping is a dismal chore, but if you figure out how to mop correctly, your business will look amazing and your customers will be impressed! So, here’s how to mop your business floors for the most effective clean. 1. Assess the condition of your wet mop. 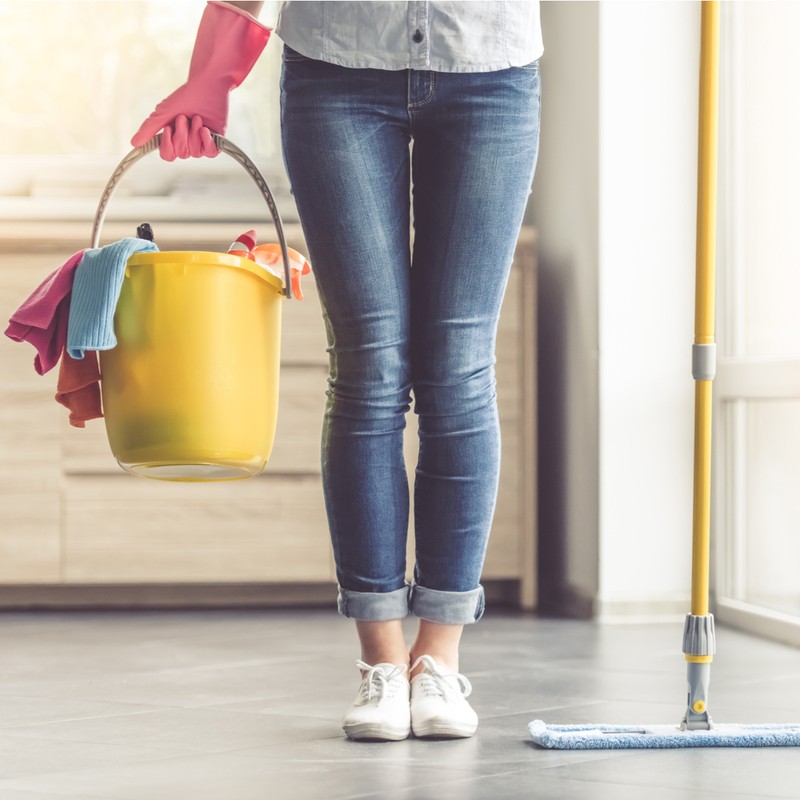 Mops can wear out, and your mopping won’t be effective if your mop is too dirty to properly absorb the substances you’re going to be pouring onto your floors. You might need a new mop head before you start! 2. Prepare the floor for mopping. Obviously, you’re mopping your floors to clean them in a way that your brooms and vacuums can’t. So, you’ll get better results if you first sweep, vacuum or use a dust mop to remove large dust particles, clumps of dirt, and any trash that may have found its way onto your business floors. For a really effective clean, use a microfiber mop! You also might need to put up warning signs so that no one accidentally slips and falls on your wet floor, and move any obstructing furniture that might get in the way of your cleaning. 3. Fill your bucket and choose your cleaning solution. For this step, it’s important to research your floor type to make sure you’re not using cleaning chemicals that will damage your floors. Once you’ve selected the right type of cleaner, fill up your bucket. 4. Dip your mop in your cleaning solution and wring out the excess. Too much moisture can destroy your floors. So, after you dip your mop in your mop bucket, wring out the excess solution using your hands or using the wringer that comes with your mop bucket. 5. Start at the back of the space, moving towards the entrance. The last thing you want to do is have to step on your freshly-mopped floors. To avoid this, start at the back of the space you need to mop, moving backwards so that you’re always walking on the dirty part of the floor. 6. Change out your cleaning solution if it gets too dirty. If you notice that your bucket is filled with dirty liquid, replace it with fresh cleaning solution. Otherwise, you’ll be mopping dirt right back onto your floors! 7. Clean out your mop and put away all supplies. To prevent all of the dirt and debris you just removed from crusting onto your mop, make sure to thoroughly wash out your wet mop afterwards and hang it out to dry thoroughly. Also, wash out your mop bucket and replace all furniture! Additionally, you may need to replace your mop if it’s already getting worn out, stained or smelly. With NorthStar Mat Service, replacing your mops is a breeze. We offer mop rental services, replacing your mop heads for you when they stop being effective! Figuring out how to mop will be a breeze. We can also provide your business with floor mats that keep dirt out of your business so you’ll mop less. Contact us today for more information!